The following is an article I wrote back in 2001 for a travel zine. Visiting Padua gave me the idea for my novel The Translation of Father Torturo. . . . I was there again last week and was reminded of this article. Of all the cities in Northern Italy, Padua is one of the most charming. Part of the reason is the relative lack of tourism compared to other northern destinations such as Milan and Venice. Considering its richness of culture and serene atmosphere, this is surprising but obviously advantageous to anyone who cares to experience the magic of Italy without being turned off by the crowds that flock there every summer. The town itself is situated along the Bachiglione River, between Verona and Venice, and is an ideal place to stop if these two cities are part of your itinerary. Its recorded history dates back as far as 300 BC, when an invasion was attempted by the Spartans. Since then it has had a rocky history, undergoing numerous wars with, amongst others, the Gauls, Hungarians and Venetians. During a period of Roman rule it was a place of great culture and was home to a number of fine Latin writers, including Livy. Later, during the Italian renaissance, it flourished. Great scholars, such as Galileo, taught at its university, which is Europe’s oldest, and numerous brilliant artists, such as Donatello and Michelangelo, lived in or visited the city. Strolling through the often empty side streets one senses that Padua probably has not changed a great deal over the past centuries. There are no little shops selling gaudy tourist goods. Instead one enjoys seeing artisans at work and browsing around the small delicatessens, where for remarkably reasonable prices one can purchase fine wines and cheeses or panbiscotto, a hard croissant-like biscuit which can only be found in the Padua vicinity. There is also the open air market, rich with the smell of roasting chestnuts, where, year round, farmers come to sell there produce, bakers their breads and sweets, and merchants clothing and household items. The restaurants and trattorias, though not overly abundant, offer a great variety of local specialties served with a hospitality not to be found in large cities or tourist Meccas. One can expect generous portions coupled with often remarkably low prices. For lunch you can enjoy a delicious hot prosciutto sandwich with a quarter litre of wine for just a few thousand liras. For dinner baccala alla Padua (salt cod with tomatoes, potatoes and spices) is highly recommended. The hotels are generally of a good quality, the Padua Board of Tourism setting much higher standard than in most other cities. A two star hotel in Padua is better than a three star hotel in Verona or Venice and cheaper. For art, Padua certainly rivals any city in Italy but Rome or Florence. The frescoes in the Scrovegni chapel are the master work of Giotto, considered the founding father of Italian painting. They rank only slightly below Leonardo’s Last Supper and Michelangelo’s Sisteen Chapel in degree of historical importance and beauty. The nearby Civic Museum has two delightful miniatures by the artist Georgione as well as a masterpiece by Guariento depicting a troop of angels moving through the night sky. Other chapels in the neighbourhood display a wide assortment of frescoes from the Giotto school, though many prime pieces were destroyed during the bombing raids of World War II. The Basilica del Santo, a church built to house the remains of Saint Anthony, contains Donatello’s Alter. This work is one of the three greatest ensembles of sculpture the western world has ever known, matched only by Michelangelo’s Tomb of the Medici and Rodin’s The Burghers of Callais. 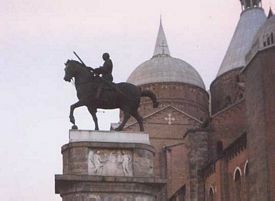 Another sculpture of Donatello, Gattamelata, considered by many to be the finest equestrian statue in existence, stands in front of the Basilica. Padua hosts a number of other famous buildings and sights, including the Palazzo della Ragione, built in 1166, and the convent of Santa Giustina, which was destroyed by an earthquake in 1172 and later rebuilt by Michelangelo. The city’s botanical garden, which is about five minutes walk from the Basilica del Santo, is the oldest in the world, dating from 1545, and certainly worth a visit. Rich in rare blooms and beautiful old trees, it is a wonderful place to spend an hour or two, strolling along the statue lined paths and perusing the greenhouses. 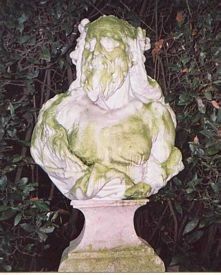 It is interesting to note that the oldest plant in the garden, a palm dating from 1584, is what inspired Göethe to write his famous essay on the metamorphosis of plants. Certainly it can be said that Padua, though not the largest or grandest, is one of the richest cities in the world. 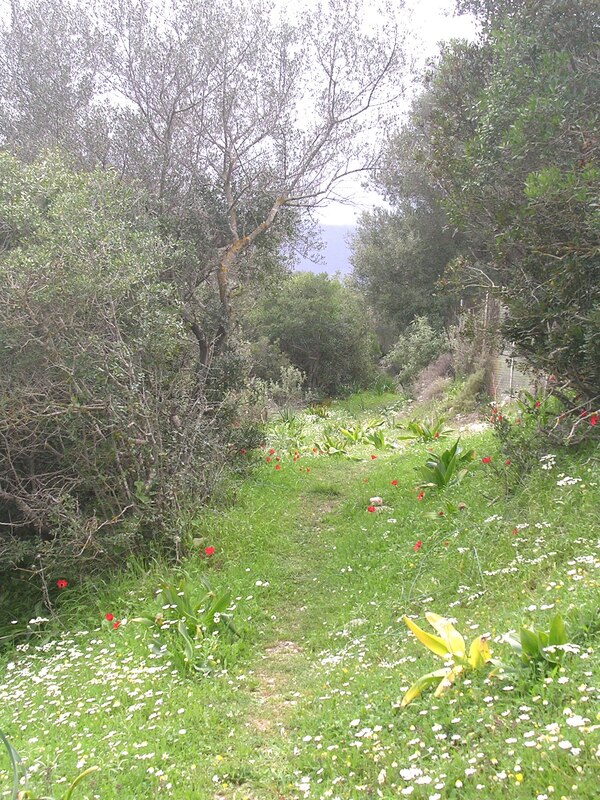 It is both peaceful and enchanting. It is full of history and tradition. The art which Italy is so famous for, can be found here in rare abundance and seen without fighting one’s way through crowds or standing in long queues. The food and accommodations are both of high quality and relatively inexpensive. After enduring the chaos of Milan and mulling through the tourist ridden lanes of Venice, Padua is an oasis, embodying all that is best about Italy. 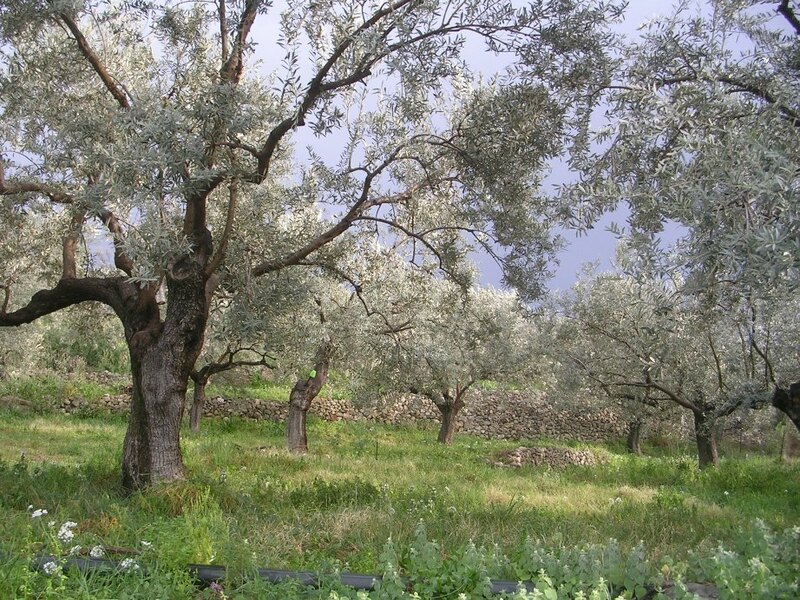 Here are some olive trees near Epidaurus.